Meet Clay, a home educator who works with autistic children and their families. He’s playful, optimistic, and open to trying new ways of getting around. Clay decided to switch from commuting by car to using mass transit and his new EcoSpeed co-powered bike. He knew he wasn’t in the shape he needed to be to ride 30 miles a day and even if he was he would need his energy to focus on his clients. He worked with the EcoSpeed team to find a strong, solid bike with a higher weight limit than most bikes. We decided on a Day6 Samson with it’s mechanical disc brakes, beefy frame, and 400 pound weight limit. Clay rides about 150 miles a week on average, traveling from client to client. He purchased a Samson Day6 from EcoSpeed and we installed our mid-drive electric assist for him. He decided to add integrated lighting so that his lights are always powered by his ebike battery. Since he wants to get the most from his battery he uses the Cycle Analyst, a battery monitor and ebike computer, to keep track of his battery use, distance, speed, and other stats. We are proud to support customers like Clay who are setting a courageous example for so many and having lots of fun in the process. 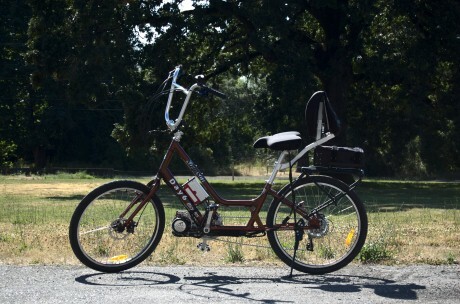 Contact us if you’d like the same ebike that Clay has. We’d be happy to set you up with this one or something similar that better meets your needs.